I could easily spend hours listing qualities that make Darth Vader one of media’s most terrifying villains, but one of the most prominent is simply how inscrutable he is. His mask and his voice give away almost nothing about his emotions, his goals, or his thought process, rendering him cold and unknowable — and nothing’s scarier than that. Charles Soule and Giuseppe Camuncoli have made excellent use of this attribute in their run on Darth Vader, and issue 19 is no exception. Despite offering up a mirror, an echo of Vader’s former life, in the form of exiled Jedi Eeth Koth, the Sith Lord remains as fascinatingly opaque as ever. 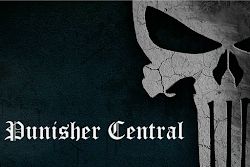 Koth is Vader’s newest target, but readers first meet him moments after the birth of his first child. Koth’s family, and the lengths he’ll go to protect them, provide a rather obvious parallel to the family Vader nearly had back when he was Anakin Skywalker, and to make the comparison more obvious, Soule even establishes that Koth was kicked out of the Jedi Order, no longer a believer himself even before Order 66. 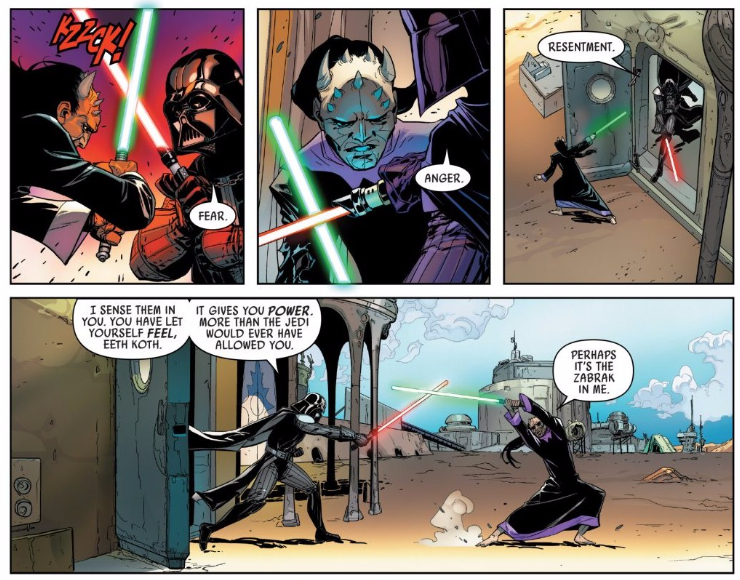 Interestingly, Soule and Camuncoli never make any explicit references to the Prequels or Vader’s past, instead leaving the similarities to subtext. Vader’s reactions are equally subtle. It seems clear that Vader himself catches the similarities between himself and Koth, but you’ve go to read between the lines a bit to really understand that. Vader could be describing himself here just as easily as he’s describing Koth, but it’s impossible to tell how Vader feels about that. Is he proud of Koth for abandoning the Jedi ways and seeking strength just as he once did, or perhaps jealous that Koth was able to do so while also keeping his family? Complicating matters, Soule avoids any easy lessons or morals. 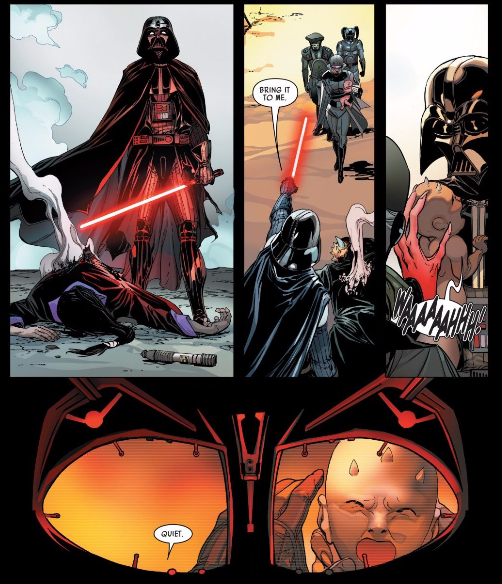 Koth’s family may have granted him more power, but they also eventually prove to be his downfall, creating the distraction that allows Vader to kill him. The one thing that’s clear is that Vader feels something. The choice to frame Koth’s child from Vader’s point of view makes for a powerful, loaded image. What is it that Vader sees when he looks at that baby? It could be almost anything, but we’ll never know the answer for sure. That unknowability could be frustrating if it wasn’t so obviously part of the point. It isn’t just readers, enemies, and allies of Vader who can’t get a read on him — neither can Vader himself. As one of his Inquisitorius underlings points out, Vader will always find someone to kill; really, what else does he have but violence, but a mission? His endless, unstoppable march of death and destruction is an effective distraction from his pain, loss, regrets, and lack of agency, from the frightening uncertainty that would otherwise define his existence. Star Wars fans know that Vader won’t truly figure out what he’s looking for for decades yet; may the force be with anyone who dares to cross him in the meantime.